A major change in lease accounting reporting for public companies is coming up in 2019 (for fiscal years starting after December 15, 2018, to be precise). In essence, leases will be recorded on the balance sheet, resulting in an increase in both assets and liabilities. The change enhances the comparability of balance sheets between companies in the same industries that choose to lease vs. own. For the accounting enthusiasts, we recommend PwC’s 316-page pdf Guide to Lease Accounting and EY’s 397-page guide. This query will search for the new standard mentions before a numerical disclosure (up to 250 words). Below, we’ve highlighted a few of the results from our own searches. Ross Stores (ROSS) is indicating around $4 billion. Dollar Tree (DLTR) is looking at a range of $5.5-$6.5 billion. Besides retail, we are seeing more substantive changes coming in transportation. Union Pacific (UNP) is looking at around $2 billion impact. Hawaiian Airlines (HA) will be adding around $500 million from its aircraft and engine leases. XPO Logistics (XPO) has around $2 billion in operating leases. To find out more about how the Sentieo platform can make your research process better, get in touch with us here. One of the most fundamental questions in financial analysis is understanding business seasonality. Seasonality is not always a yes-or-no question, but rather a continuum: some business are distinctly seasonal, and some less so. We all “know” that most tax preparation happens at a certain time of the year, while retail stocks vary quite a bit. But while revenue/Income Statement seasonality is “obvious,” in this post we will focus on Balance Sheet seasonality. We will use Ulta Beauty Inc. (ULTA) as an example. If you are interested in how the Sentieo platform can make your research process more efficient, please get in touch. One of the most substantial recent changes in public company accounting is ASC 606: Revenues from Contracts with Customers. The changes affect a wide range of public filers, from SaaS companies to real estate managers, to fast food franchisors. This post will focus on what analysts can do to efficiently see what has changed in their coverage universe. For the accounting enthusiasts who want to know more about the changes themselves, we recommend KPMG’s 1,100-page implementation guide. As the implementations have been rolling in the filers’ SEC filings, we find that two Doc Searches can help analysts find the adjustments provided by the companies. 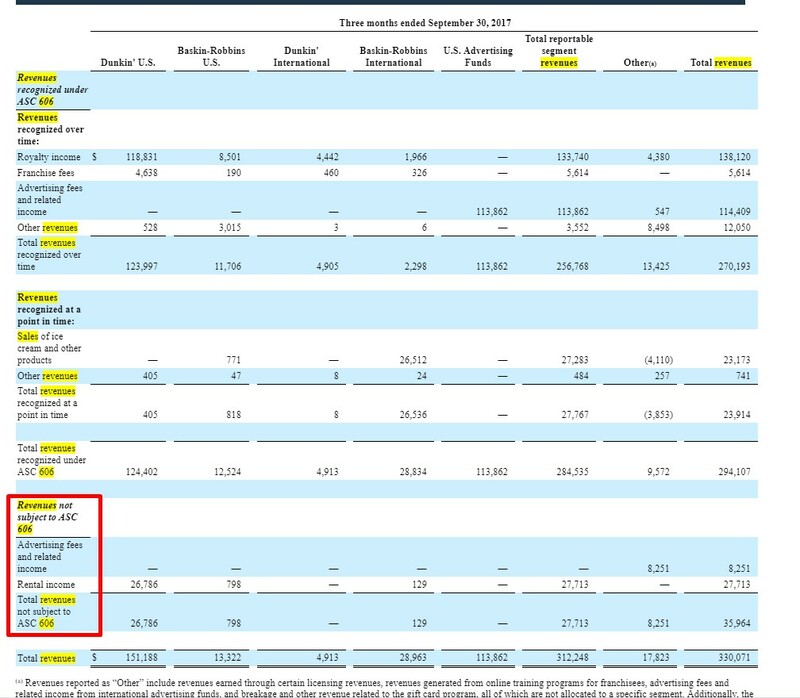 For income statement changes, we use IN:TABLE search for revenue within 200 words of “606.” In Sentieo, analysts can search specific company documents, docs from several companies (tickers entered manually or in a saved watchlist), or general search (which can be modified by factors such as market cap, headquarters location, specific filing forms, sector, and many others). For balance sheet changes, we use IN:TABLE search for equity, within 200 words of 606. Using these searches enabled us to find what we need, in a fraction of the time that older search methods require. Here are some of our findings. Intuit (INTU), parent of QuickBooks and TurboTax, went from a loss to almost break-even in its third quarter under the new standard. 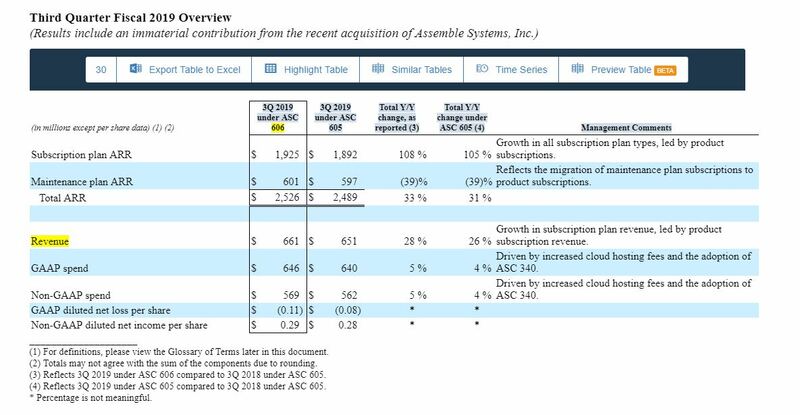 SaaS company AutoDesk (ADSK): we see that both revenues and the closely watched ARR numbers are affected. Dunkin’ Brands (DNKN), franchisor of Dunkin and Baskin Robbins, analyzed the applicability of 606 to its revenue streams (franchise fees, advertising fund fees, products, rents), and Sentieo provides a detailed breakdown. Our balance sheet search mentioned above picked up some notable changes, too. Commercial real estate broker and manager Jones Lang LaSalle (JLL) saw several changes in its balance sheet, notably the creation of several new line items related to the adoption of 606. SVB Financial (SIVB), parent of Silicon Valley Bank, also reported major changes in its accounts receivable and its deferred revenues on its balance sheet. 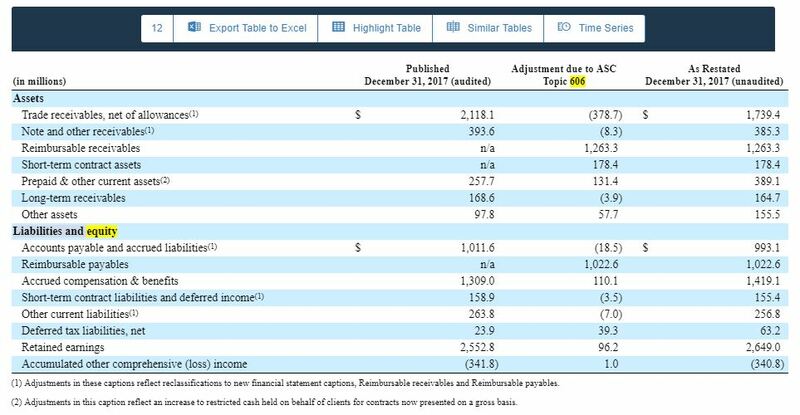 Finally, telecom Sprint Corporation (S) saw balance sheet adjustments in a few categories, including the addition of $1.2 billion of customer contract acquisitions on the Assets side, and a $1.3 billion swing from negative accumulated earnings to positive. If you’d like to learn more about how using Sentieo can help your process, get in touch. Sentieo is a research platform built by former hedge fund analysts to speed up the research workflow. Visit Sentieo.com to sign up for a free trial. Nothing on this website should be considered investment advice. We do not make recommendations (long or short) in any securities. We do not express opinions as to whether any company's accounting practices are in violation of SEC, GAAP, IFRS or other rules/regulations.